As you can read in the discussion linked above, installation targets for Linux-based systems have been removed. But you can simply run Dooble from within the build directory after make has finished. Before that, however, you'll have to set LD_LIBRARY_PATH to point to the "libSpotnOn" folder. I've written myself a two-line shell script that always does that before starting the browser. jajaja please, gime a break, you are using a piece of software that have same behaviour..
well today there's no so many choices.. its a guindows like manpowers in everywhere.. I would understand if someone stick to his words and don't change them in such a timeframe. What happen there seems to be, hey we will focus on black and month after OK pardon (with no pardon we will focus on white. For those who insist on more than suckless surf there's Midori or QupZilla or maybe just dillo or netsurf? In the long run, though, maybe best to use a fire-jail'ed browser cloud VM/appimage instance? The only reference in this forum of Qupzilla is yours, now there will be two. It is not as minimal in footprint as portrayed, but in Devuan it is alot lighter than in systemd distros. Somehow all the qtwebkit processes that would run along in systemd (10-15 of them) are not active here. But I am confortable with it and it is not made by google/mozilla Inc. Midori was crap, I only struggled with it for a couple of days. Dillo is fine if you are editing plain no script html pages and want something light to visualize them in the background. For plain html5 pages/sites (devuan/debian/torproject/etc) it may be fine. Qupzilla 1.8. * is more than 2 years old. Sid/Ceres is now testing 2.1.2 .... WHAT A LEAP! Manjaro has had 2.1... in stable for quite a while. As I write this I am upgrading to ceres from ascii as it is the only way I can get qupzilla. Sounds silly, I know. I have my refractasnapshot done (you guys should try it if you haven't already). Mark this as bluff failed. The whole system upgraded to ceres, all fine. Qupzilla and its lib codependency. An upgrade will cause breaks it says. I am on Palemoon right now, Dillo when I don't need to flap my jaw or access anything that needs a password, w3m when GUI annoys me, and am still looking around. I don't see GNU Icecat in the reps, but I have used it on Trisquel and would prefer it on my 64 bit machines. It might be a bit heavy for some of my 32 bit machines, but still worth a test drive and some education for my illustrious self. My biggest concern is that I would prefer to run exclusively free software and am trying my wings at holding my own hand instead of asking others to do that for me. wrestled it on to (some of) my beasts, and it's not too heavy for them at all. Preferred browser on preferred operating system. Mission accomplished. * Being made by Google, I'd only use Chromium as an absolute last resort. Remember, your browsing data is Google's main "product". The iridium browser project is trying to eliminate this drawback from using Chromium. They also provide binary packages for a few major Linux distributions, including Debian. These should also work on Devuan. The main 'selling point' that was used for Google Chrome to beat Firefox for market share was it was faster. Turning Firefox into Mozilla Chrome seems to be Mozilla's answer. Though some of the decisions they have made make me wonder who the Firefox developers really work for. Now on with my search for a browser that I can live with, that is able to handle the 'modern' internet. i tested slimjet and i think (due i dont use youtube to work) its the most efficient and faster browser! YouTube is very handy if you want to work on your hardware, the odds are fairly good someone else has taken one apart and posted the video of it. Yes, but Quantum now requires pulseaudio to use alsa. Supposedly apulse will substitute but I haven't tried it. Your web would look different, smoother, and free for everyone. midori. More specific its latest version, midori-7. On my old box running NetBSD 8.0 it looks really promising. (And Midori 0.5.11 crashed when i treid to log into paypal.) Any packackes available for Devuan (i am here on ASCII)? I have been happily using Pale Moon for the last 6 or 7 years (started with it while on Windows), and have Basilisk as a backup. There are no other browsers out there (right now) for me, except maybe Waterfox if I had to. Well, we all have our preferences. Here on my large ASCII desktop (64bit hardware with 32 bit OS) i am running qupzilla (pretty unstable...), chromium and palemoon more or less permanently and midori for specific tasks where i want to ensure that everything is cleared after the session (banking...). In NetBSD/i386 midori is the only acceptable browser - native alternative is just an old and slow version of firefox... but anyway, midori is an interesting project i am following (and using) for quite a while. And midory 7 uses a much cleaner GUI that 0.5.11 ... so it would be really nice if there was at least a debian package..
On my very new notebook i (64bit ASCII) i tried Iridium, but failed due to a library version mismatch - the binary is made for Ubuntu. So in conclusion, there seems to be the need of a free, not too feature overloaded web browser, ideally independent on any specific GUI environment. Debian/Sid has it and a quick and dirty rebuild on ASCII is doable. I haven't looked longer at Midori. A while ago it only could do http/https and no other protocol. And with today's quick and dirty build, I got lost in GitLab because some stuff in GitLab's menu refused to cooperate with Midori. Midori will not be my future browser. Falkon is going to be integrated into KDE, and hence Qupzilla will die, at least as a standalone browser. There is a significant community outside the KDE/GNOME/XFCE folks, and these (or maybe especially these?) might be the main community for the smaller browser projects independent on any desktop. Anyway, regardless if someone likes midori or not - it is part of debian and hence devuan. In a meanwhile old version. A reasonably well tested port might be a serious candidate for the backports, won't it? But anyway, i think i'll try a build and check the sid patches before, as soon as i have the time. Ive been sticking with palemoon too, probably about 2 years now. Only thing its not very good at is putting up with google maps so i switched to whereis.com maps and it handles it nicely. Many of the old legacy plugins in are available in palemoon too. I keep palemoon in a firejail for a bit of added security. Waterfox is a backup i have if needed. Many of the old legacy plugins in are available in palemoon too. Here's a link with probably thousands (yeah, thousands) of legacy (so-called) add-ons. I would guess that a high majority will work in Pale Moon. Hope some will find this link useful. Midori is a nice a clean browser. Tried Falkon too. But I find both a little to buggy as main browser. I use Basilisk now, before Palemoon. I keep Firefox ESR installed as backup browser in case a website I need doesn't work. 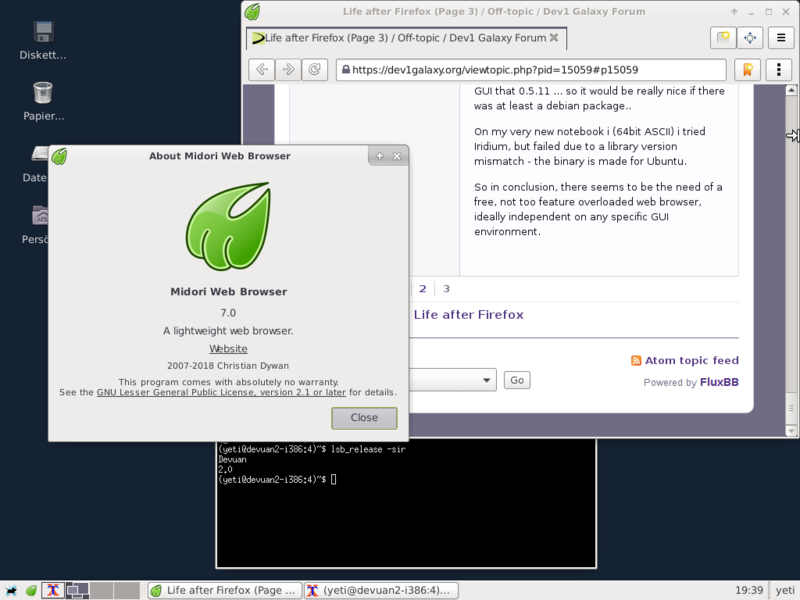 Basilisk is a fine browser fast and with ABL, a cookie cruncher and eMatrix I'm free of adds and annoying stuff. I also added some extra entries in my hosts file to block tracking, adds, google and facebook.